Your lessons matter. Your strategies matter. Your relationships matter. Lots of other things matter too. Some of these things are in your control and some of them are not. But in every decision you make, in every action you take, there is a common thread. What is your mental approach? Do you have a growth mindset? Are you an empowered educator? Do you believe in your ability to make a difference? Do you have a strong sense of self-efficacy? A person's mental approach to any situation has an incredible impact on outcomes. The choices we make determine our future. It is our choices more than any other factor that determine who we are and who we will become. I believe that's true for students, and I believe that's true for us as educators as well. 1. Extraordinary results require you to expect big results. Extraordinary results don't happen by accident. Just look at what successful people do, and you'll see what it takes. First, you have to believe great things can happen. Some people are hesitant to set the bar very high, because they might fall short. Others think about how much work it's going to take to get there, and wonder if it's going to be worth it? But if you're not willing to aim for extraordinary results, are you settling for less than what you're capable of doing? And if you're settling for less, are you giving your students an experience that is less than they deserve? You deserve to be your best too. Crave that which is not easily within your grasp. Dream big. 2. It's not lack of time, it's lack of direction. We all have exactly the same number of hours in each day. We have the same number of days in each week. I've rarely heard anyone complain about lack of time who also wasn't wasting some amount of time every day and every week. The key is how we are using the time we have. Are you making the most of your time? Are you giving time to the things that will make the biggest impact? Do you know with clarity what's most important in your day? Choose to pour your energy into the things that will transform your effectiveness. You have to take risks. You'll miss 100% of the shots you don't take. What actions are your multipliers? They make everything better. They pay dividends into the future. Pour your energy into things that give the most returns. Find your true north and set your direction accordingly. 3. Be willing to let of go of something good for something great. Most people reach a certain level of effectiveness, and then they just maintain the status quo. They get into a routine without continuing to stretch and push forward. Too often we are polishing the past, trying to improve on practices that are simply outdated or no longer effective. We're aiming to make things just a little better instead of opening our minds to new possibilities. Don't settle for good enough. Don't settle for teaching as you were taught. Our world is changing faster than ever before. So our schools should reflect those changes. We can't allow schools to become time capsules, when they could be time machines. We need to adapt and create learning that's relevant to the world our students will live in. 4. See problems as they are, but not worse than they are. I believe in the power of positive thinking. But positive thinking, in my mind, is not believing everything is okay. It's not pretending everything is great. But it is believing things can get better. It's focusing on solutions, not problems. We need to see problems for what they are, but not act like they are impossible to overcome. Some people focus their energy on blaming and complaining. They throw their hands up and quit. Their solution is for everything outside of them to change. But a different approach is to be focused on pursuing excellence. No obstacle is too big to stop trying. They believe that with hard work, determination, and the desire to continually learn and grow, there is no limit to what might be possible. 5. One of the best ways to increase student effort and engagement is to increase your own energy and enthusiasm. What type of energy are you bringing to your classroom or school? I notice some of our students dragging into school with very little energy. What's it going to take to shift that energy and get them going? Many of our students have developed habits that prevent them from getting the most out of their learning. Those habits won't change unless we as educators are intentional. We need to change. We need to bring so much determination and passion to what we do that students know, "This person is not going to accept less than my best." 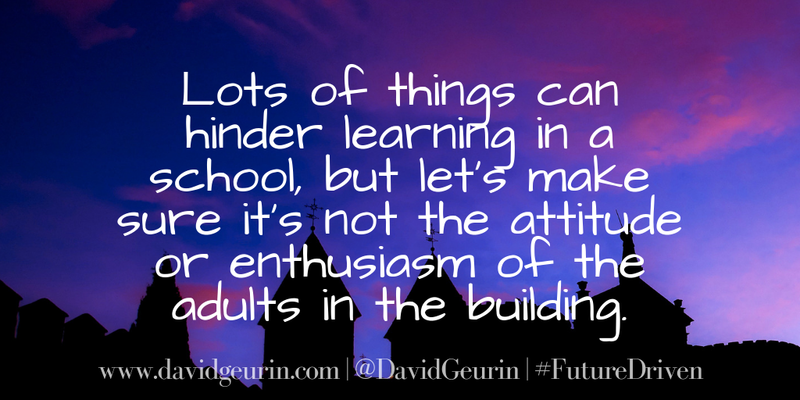 Lots of things can stand in the way of learning in a school, let's make sure it's not the attitude or enthusiasm of the adults who work there. What other ideas do you have for establishing a solid mental approach as an educator? I want to hear from you. Leave a comment below or respond on Facebook or Twitter.